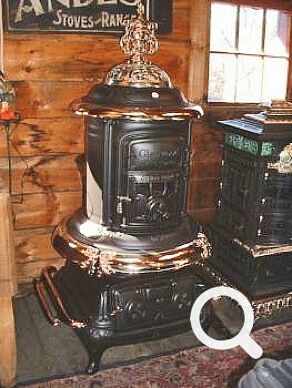 Mica baseburner, wood and coal, extra large stove. 5 lovely blue tiles, brass finial, large mica windows for fire view. This is a top shelf stove of high art design with crisp, clean castings. A large, powerful and economical heater. Great for heating a large open space area. Burns either coal or wood. Mica windows for fire view. Triangular grates. Large capacity, will easily burn 24 hours on a load of coal. A very handsome heater. Lots of nickel trim. 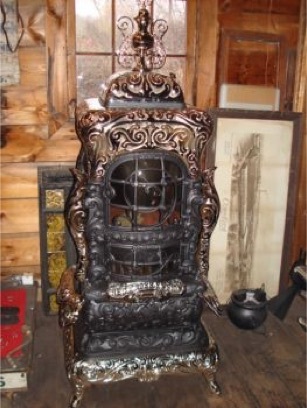 Built by Germer Company in Erie, Pennsylvania in 1891, this antique baseburner has it all. The finial is Pandora with an amber knob, nickel plated angels on corners, 5 art tiles, mica doors on 3 sides, serpent side rails, paw foot nickel base, cherubs and faces on the side. If that weren&apos;t enough, this stove burns either wood or coal. 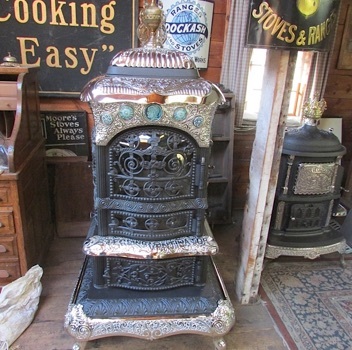 If you are looking for a mint, over the top outstanding stove, look no further. 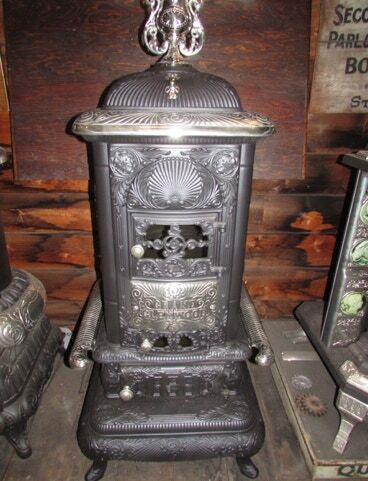 Built in 1895 in Rochester, New York, this coal stove can also burn wood. 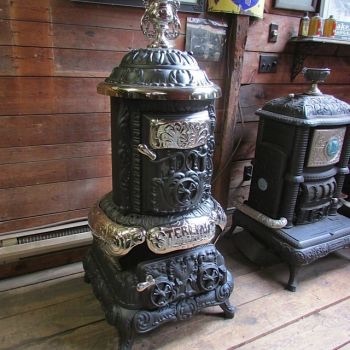 Large mica windows, large fire pot, fantastic nickel all wrapping a very efficient antique stove. Full of ornate details from top to bottom, simply stunning. 27” Wide x 29” Deep x 65” High.